I find it useful to take the small diagram that comes with each Ambassadeur to the local photocopy shop and blow it up to A4. Not only is it easier to read at that size, it is also less likely to get lost. In fact I keep a file with blow ups for all the Ambassadeur models I have plus some others downloaded off the web. This might be a bit sad, but it makes life simpler when it comes to ordering spares! Parts concerned if adding bearings are highlighted. More schematics can be found through the links page. There are a number of acronyms and esoteric terms used in describing Ambassadeur parts and functions. This page should throw some light on them. A feature introduced around 1990 which instantly prevents the handle turning backwards by the use of a one way roller bearing through which the main drive shaft runs. Previous mechanisms relied on a dog operating on a cog, and so allowed some backward movement of the shaft and handle. Makes reels feel more solid in use. The first time the word "Ultracast" was used it was to describe a new spool system where the spindle was seperate from the spool, and fixed in the frame of the reel. The bearings were placed internally at each end of the spool, rather than in caps on the side plates at each end of the spindle. Later the Ultracast Ambassadeur was introduced - with the letters UC preceding the reel number. The spool and bearing configuration was changed again in these reels. In UC reels the spindle is again fixed in the spool, but the bearings are located externally on the spool and locate in drums on the redesigned end plates of the frame, the bearings being of different sizes too. I don't understand this at all. I've read the definition in Tight Lines and I'm none the wiser! A feature of UC Ultracasts and some other series. A feature that just about eliminates backlash through angler ineptness. Unfortunately it also cuts casting distance. This is a system that allows the drag to be slackened simply by turning the handle backwards. Was available on certain XLT series LHW low-profile Ambassaduers. Not available on IAR reels! The central part of the reel in which the spool is housed. The pressed sheet metal housings that shield the internal workings of the reel at each end of the cage. The adjustable cap in the centre of a side plate that applies braking pressure directly to the spool. A (pointless) piece of plastic above the spool for you to rest your thumb on. What's wrong with the top bar of the cage for that? A plastic bar at the back of some reel cages which, when pressed down with the thumb, disengages the spool for casting. Found on reels with a '6' as the second digit, eg - 5601. The clicker is also known as the line out alarm - when switched on it makes a clicking noise when line is pulled from the spool. It is operated by the sliding plastic switch on the outside of the right hand side plate - or (rarely on lhw reels) by a sliding button on the side. The click plate is where the clicker mechanism lives under the side plate. Not all clickers have a click plate as a variety of mechanisms have been used over the years. The thing that lays the line evenly on the spool. This is the mechanical brake that works on the spool spindle and is controlled by adjusting the small cap which is located on the right side of the reel on old style Ambassadeurs and on the handle side of the reel on the modern style with the palming right side plate. Picture here. A switch (no, seriously) which when engaged make a Thumbar release disengage the gears only while it is held down. As soon as the Thumbar is released the reel goes back in gear. There is a distinct knack to using this feature, which has only been found on low profile lhw Ambassadeurs as far as I know. 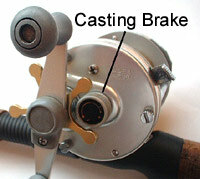 Get it wrong and the reel engages in mid cast with (often) a horrible noise from the gears! Named after the 'Flipping' technique used by bass anglers in the US and elsewhere - not after what people might call it when the reel goes into gear when it shouldn't!